Thrive Global shares 5 types of herbs in Mexican culinary culture that are interesting and yet complex herbs. By taking a dive into just a small section of the Mexican culinary culture, why don’t we discuss at least 5 types of herbs that are common among Mexicans? This is a special type of herb that packs a wealth of benefits in terms of the nutrients it offers. This herb requires full sunlight or can also grow well under some light shade. It performs better in moist soil which is well drained. This herb should not be grown in hot weather as this makes it bolt very quickly. It is advisable to maintain a spacing of between 6 to 8 inches when planting cilantro. While cilantro is known to contain no cholesterol and is low in calories, its green leaves contain essential oils, antioxidants, dietary fiber and vitamins such as vitamin C, vitamin A, vitamin K, folic acid and beta carotene. It is also an excellent source of minerals like calcium, iron, magnesium, and potassium. Culantro and cilantro are two herbs that can easily confuse you if you are not so keen. Culantro grows well in partially shady areas where you can expect to experience prolonged harvest seasons with very large leaves. If grown in sunny areas then culantro will flower earlier hence resulting in a shorter lifespan as compared with those grown in partially shady areas. A spacing of 8 to 12 inches is usually recommended to be used when planting culantro. It has so much medicinal value to human beings. It contains iron, carotene, riboflavin and calcium that is necessary for keeping us healthy. The leaves of culantro are effective in treating constipation, diabetes, fevers and curing flu. Culantro is also used in alleviating stomach pains while its roots when eaten raw help in curing scorpion stings. What’s more, culantro is also very rich in vitamins. It contains vitamins A, C, crude oil and calcium as well. The calcium content in culantro helps in building strong teeth, bones, and hair. This here is yet another one of the Mexican culinary culture herbs that you should try out. This herb can be grown from seeds or is also sometimes grown as a cut and come again plant. This herb can grow perfectly well in full sunny areas or even in partially shaded areas. When it comes to the type of soil, it grows well in any soil with a lot of organic matter content and a slightly acidic pH. It also requires a sufficient amount of water at an optimal temperature of around 60-65 degrees Fahrenheit. Kale contains a lot of nutrients that are beneficial for us as human beings. It has vitamins K, A, C, B6, manganese, magnesium, potassium and copper. It is also loaded with some powerful antioxidants such as kaempferol and quercetin. These antioxidants will help in counteracting the oxidative damage caused by the free radicals in our bodies. By minimizing oxidative damage, the leading drivers of many diseases like cancer and aging are well taken care of. The broccoli is well known to almost all herb lovers. The best quality broccoli is that grown in fall because it can be somehow challenging to predict the spring conditions. Too much heat can stress up the broccoli and make them open their flower buds prematurely hence leading to bitter broccoli with less tasty and small florets. This herb requires slightly acidic soil and enough sunshine. It is advisable to use a spacing of 15-18 inches between the broccoli plants when planting. One of the strongest points of broccoli is the high nutrient package that it packs. This herb contains various minerals, fiber, vitamins, and bioactive compounds. Broccoli also provides antioxidants that are essential in offering us protection from various diseases. The presence of fiber may also aid in controlling the blood sugar level as well. There are also several studies that indicate that this herb can support your health in so many ways. What’ more, broccoli also promotes reduced constipation and healthy digestion. Here is yet another herb that most people love due to its nutritive and general health benefits. It grows perfectly well in sunny locations with loose soil which is also well drained. This herb can be grown either indoors, outdoors, in hydroponics or in containers. Garden cress performs well in a somehow narrow pH range of 6.0 to 7.0. The recommended spacing should be about 2.5 cm. When it comes to the benefits of garden cress, the sky is the limit. It is believed that this herb potentially has some anti-cancer effects. What’s more, this herb provides a lot of carotenoids which is excellent for the health of your eyes and your vision in general because it has vitamin A in abundance. This herb will also provide you with enough vitamin C which will keep your bones, gums, and skin healthy. Vitamin C also helps in providing some cardiovascular benefits. This is together with vitamin K which is also present in garden cress. All the herbs discussed above are very important to every human being because of the nutritional and health benefits that they provide. 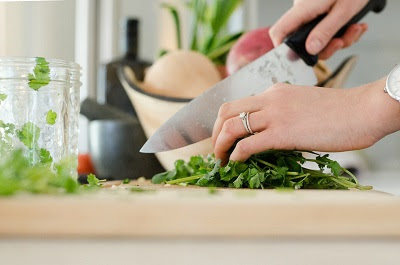 Apart from just spicing up your foods and providing the best delicacies, these herbs will make sure that you are always healthy and as fit as a fiddle. Maintaining better health is a very valid reason why you should try out these herbs discussed above. I am Rank Feed and I am a great herbs enthusiast. I am the owner of growherbsgarden.com website when I share some of the best tips on how to care for herbs and get them ready for your kitchen. Vanilla is the world’s second most expensive spice after saffron and one of 16 Mexican products that enjoy denomination of origin protection, but its long-term survival in Mexico is at risk. The product is increasingly being targeted by thieves, driving growers to abandon the crop and grow something else. “The law has to be updated,” he said, adding that new, specific laws that set harsher penalties for vanilla theft should be adopted nationwide. In recent years, a huge number of vanilla growers in the north of Veracruz have given up on cultivating the plant after seeing their hard work come to nothing as a result of theft. It takes three years on average for producers to get to the stage when the pods on their vanilla orchids are ready for harvest, whereas thieves can profit much more quickly. “Just imagine, years of work is stolen in minutes,” said Juan Salazar, a vanilla grower in El Ojital, a community near Papantla. Vanilla orchids: years of work can be stolen in minutes. The farmer said that vanilla theft usually occurs in October and November just before the harvest, explaining that higher prices for “gourmet” vanilla in recent years – the per-kilo price has tripled – have only encouraged would-be thieves. Salazar, who grows vanilla on a three-hectare property for customers that include tequila and perfume makers, said that growers last year were forced to take drastic measures to protect their crops. “To guarantee that they would be able to harvest what they worked for the entire year, they [the growers] stayed at their plots, they made fires, and they slept 10 meters away because those who cut [the plants] enter in the early morning,” he said. “A lot of farmers carry machetes, but if a thief has a gun, one puts his life on the line,” Salazar added, explaining that there have been cases in which growers have been killed while defending their plants. While many producers have decided to get out of the vanilla-growing business altogether, others agree to sell their yield to opportunistic buyers who prey on their fear, Salazar explained. 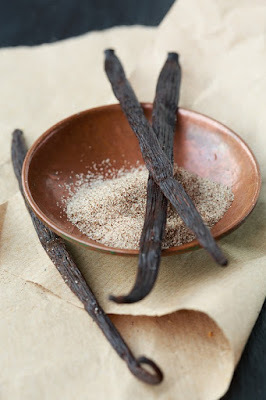 “They come to purchase the vanilla early before it completes its nine months of ripening. They pay low prices and the producer sometimes prefers to sell . . . so that their crops aren’t stolen,” he said. In light of the increasing number of thefts, vanilla growers have appealed to authorities to bolster security in the north of the state to protect their industry as well as others, such as tourism. “Vanilla has to be protected, it’s in danger of extinction and like any other species or animal that is in danger of extinction and for which laws are to protect them, the same must urgently be done with vanilla,” said Ramírez, the growers’ association president. "Each year, as winter gives way to spring, tens of millions of monarch butterflies leave the safety of their wintering grounds in central Mexico and migrate north. But the history behind how the global scientific community finally came to understand the unique role that this part of Mexico plays in the lifecycle of monarchs is just as fascinating as the butterflies themselves." 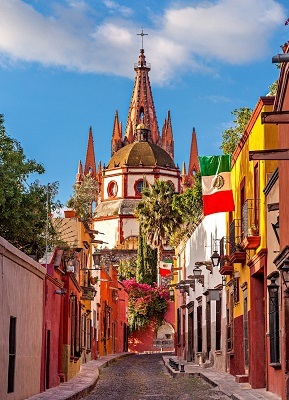 San Miguel De Allende, Mexico The historic and colorful Aldama Street in San Miguel De Allende is a must-see for any traveler heading to centrally located Mexican city. Roughly 170 miles north of Mexico City, San Miguel De Allende was voted the "2013 Best City in the World" by Travel + Leisure. If you are open to meeting strangers in San Miguel, you can learn much. I was walking Javier this morning, stopped to say good morning buenos dias to a man who looked familiar to me. "Are you celebrating Viernes de Dolores tomorrow?" he said. He explained April 12, 2019, is "Friday of Dolores. "It corresponds to the Friday before Palm Sunday. It is within the "last week of Lent," known as the Week of Passion. In some localities, it is considered as the beginning of the Holy Week. Many celebrate with altars in their homes, and they share food items with neighbors and friends. it is a devotion to make an altar to the Virgin of the sorrows of 7 steps. Each step symbolizes the 7 weeks of Lent. The first tier has an image of Christo Ariva. It is covered with white Savannah and decorated with maize or wheat. They are beautiful as offerings. Oranges are also placed as a symbol of the stones of the road to Calvary and lit with candles. At nightfall, people come to visit them and ask questions. 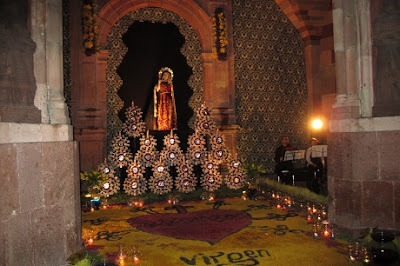 When they arrive (the Virgin is already crying), the people of the house say so. They go over and give them a glass of fresh water. of Jamaica or Tamarindo or of the fruit that they wish symbolizing the tears that the painful one shed. Look what I learned about San Miguel, Mexico from Juan by slowing down and showing an interest. Juan invited us to view his family’s altar. 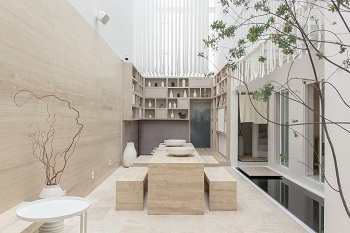 A look inside of Ryo Kan, a new hotel designed by architect Regina Galvanduque of GLVDK Studio. When expats sit around and talk, the conversation covers the latest news about San Miguel, the outstanding weather (Can you believe it's December and we are eating dinner outside on the terrace!). 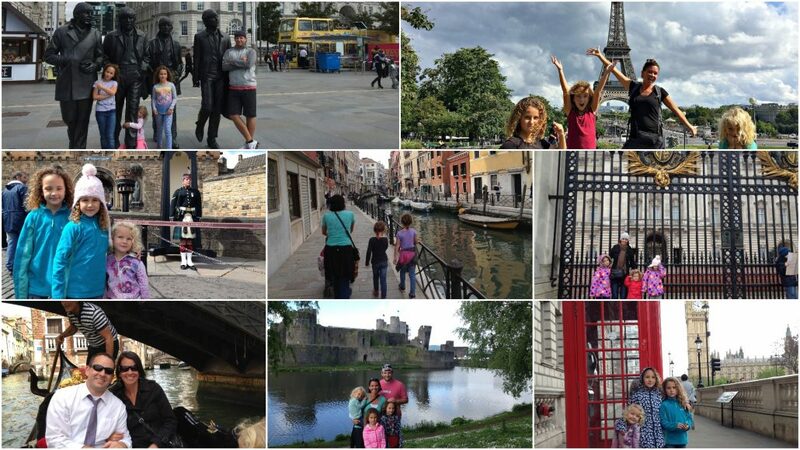 We talk about the restaurants, people coming to visit, safety, our health (We are always grateful for our health. ), and the weather. It’s with a sad heart that I even write this. But I gotta say it. We have decided to leave Cozumel, Mexico. back. I mean, we’re moving away from here for an indefinite amount of time. I still stand by every word I wrote. I still love the word “amigo”. 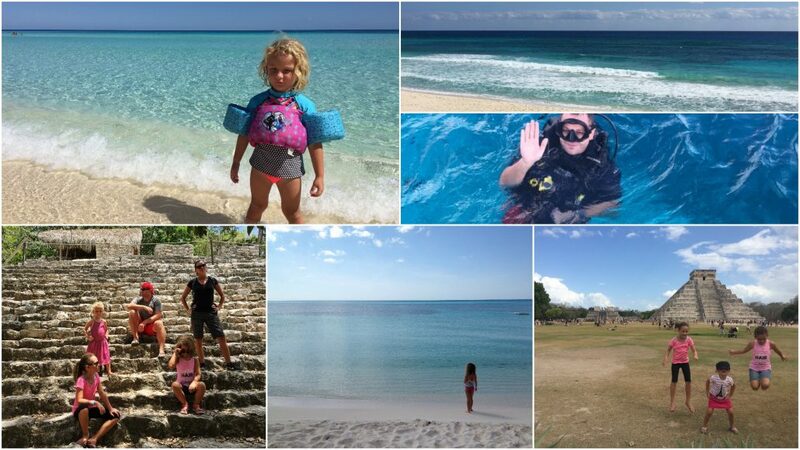 If you’ve seen our timeline, you know that we first came to Cozumel back in 2012. We planned to stay initially for only 6 months. “We’ll stay as long as it’s fun,” we said. It turned into 2 ½ years! we got bored and ended up coming back to Cozumel. It’s hard to put into words why were leaving. We love it here. to knock out in the next two years. We feel like changing things up will help us do so. so that we can grow more. wo visits a month from friends and family coming to check out Cozumel. Sure we can say “no” to visitors I suppose. But actually, we can’t. And we don’t. So while it’s not the main reason we’re leaving, it’s definitely on the list. crying happening. We didn’t realize how much we’d grown to love this place. comes, which is next month. Obviously, the question is: where are we going next? how do you choose one place to actually live? learn and do and enjoy. So which country are we going to specifically? I know it’s not most people’s first choice for a vacation but it’s actually pretty perfect for us. We love Mexico. There are certainly a lot of things we will desperately miss. What does "Cabrón" mean in Mexican Spanish?